To become a member follow the three easy steps below. If you have any questions regarding renewing a membership see the Membership FAQs below or click the Live Support link above to speak with a Membership Specialist.. If you are already a member and need to renew your membership, choose an option below. A My USSA account allows you to manage your membership(s) among several other benefits. To create a My USSA account click the "Create a My USSA account" button below to open a new window to create your My USSA account, which is absolutely FREE. You will later use your My USSA account to link it with your member account(s). 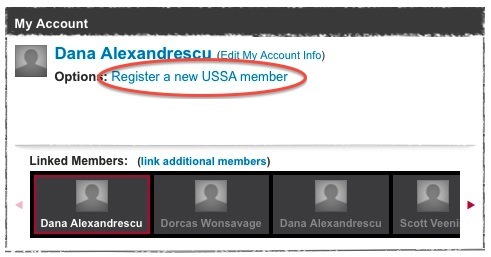 If you have already created a My USSA account then log into it. If you have forgotten your My USSA username or password click here. Register a new USSA member. In the "My Account" box on your My USSA page click the link "Register a new USSA member". You will be redirected to the online Membership application. You can register a new USSA membership for yourself or for someone else (i.e. a parent who needs to register a new USSA membership for their kid). The online Membership application will walk you through the necessary steps of purchasing a membership. Once you have completed the online Membership application visit your My USSA page. In the "My Account" box click the "Member Card" link to download and print your membership card. 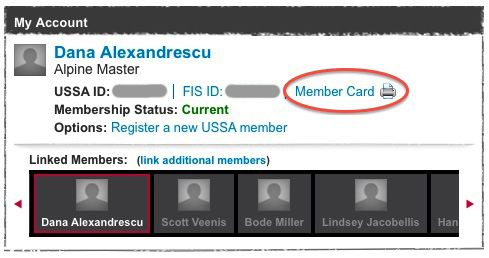 If you registered a USSA membership for someone else then you'll need to click on their profile in the "Linked Members" section of the "My Account" box to print their membership card.